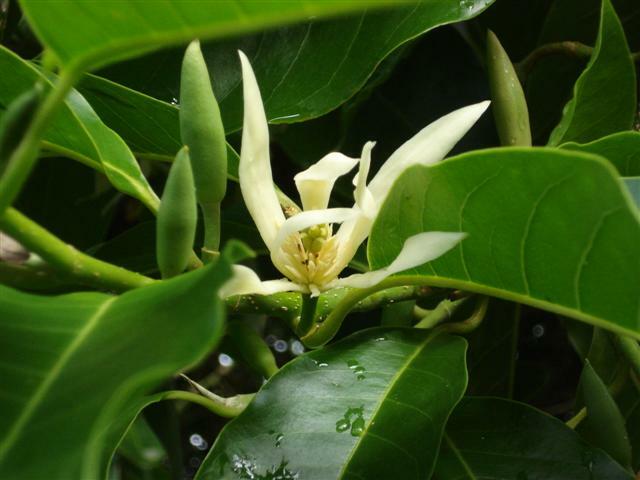 In our southern hemisphere summer, Michelia alba is in flower. One could never describe alba as being in full flower – it just gently flowers over a long period without ever putting on a mass display. We planted it near our swimming pool so it could perfume the air in the summer months but as it grows ever larger, we are wondering if we have made a mistake. After about eight years, it is already around eight metres tall and showing no sign of slowing down. It has splendid foliage for those in warm enough climates to grow it and the flowers make up for their rather understated (almost insignificant) appearance with their heady fragrance. We have never seen any evidence that alba is fertile, either as seed parent or pollen donor and lean to the belief that it is likely that there is only one clone in existence and that is sterile. We have champaca (believed to be the seed parent of alba on the premise that alba is most likely a natural hybrid) which has attractive colour in the flowers but the forms we have seen are scruffy as garden plants. Mark’s Fairy Magnolia Blush (the first of his michelias to be released) is also summer flowering but these are random blooms which lack the colour of the main spring season. We have decided that the move to lump all magnolia relations, including michelia and mangletia, into the magnolia group is not helpful so we are going to remain with the former nomenclature at this stage. Mark is of the view that michelias are a distinct group which warrants being kept separate. As far as he knows, nobody has yet proven that they can successfully cross michelias with magnolias, or indeed mangletias although some have claimed hybrids. We will wait for proof because we doubt that it is possible to achieve crosses between distinctly different groups without scientific intervention. Many of the deciduous magnolias are summer flowering at this time but we never get particularly excited about these. They are bonus flowers, tucked in amongst the foliage, and they lack the impact of the spring flowering on bare wood though it should be said that Black Tulip has put up some fine dark flowers this year. Iolanthe, Apollo and Serene all have summer flowers – in fact most soulangeana hybrids will do so. With our very strong sunlight (blame the depletion of the ozone layer along with our clear atmosphere) summer flowers tend to burn. 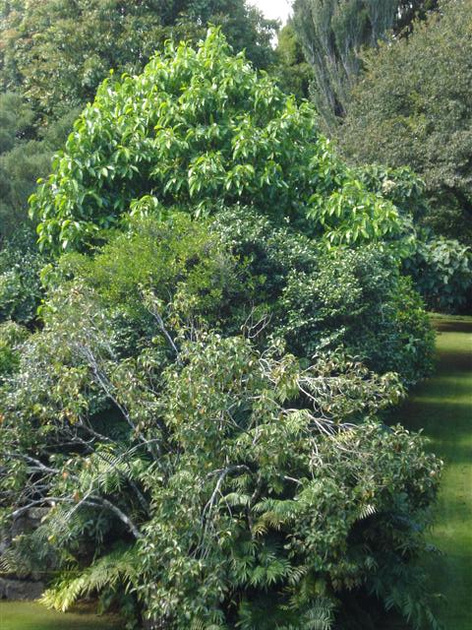 Magnolia Serene has stand out dark foliage. Generally speaking, the foliage on deciduous magnolias does not excite much interest and in summer, most of them are just green trees with relatively large leaves. But when we cast our eyes around a number of trees in our garden landscape, Serene stood out as having deeper colour and appearing glossier than the others nearby. We think it has considerable merit as a specimen tree for its summer foliage as well as its form and spring flowering. Some magnolias stand the test of time and this is one of Felix’s where we are surprised that it has not been picked up more widely in the marketplace. 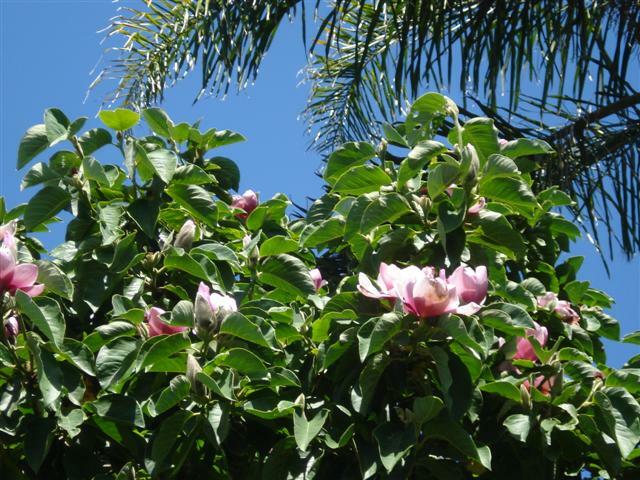 With its later flowering (ref Magnolia Diaries 11 and 12 to see the flowers) it should perform well in cooler climates. This entry was posted in Magnolia diary and tagged Black Tulip, Fairy Magnolia Blush, Felix Jury, Iolanthe, Jury magnolias, Magnolia Serene, Michelia alba, Michelias, New Zealand magnolias, red magnolias, summer flowering magnolias on 19 February 2010 by Abbie Jury.